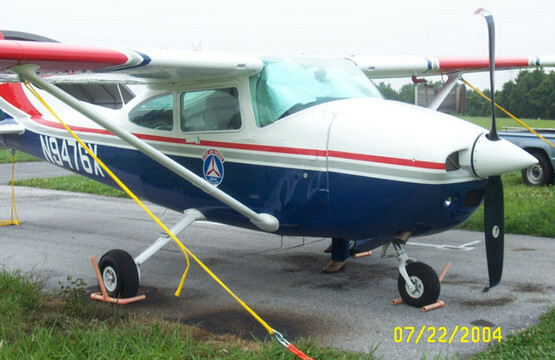 A Maryland Wing, Civil Air Patrol, Cessna 182-R [N9476X] was involved in a hard night landing accident at the Freeway Airport in Mitchellville, MD, on July 21, 2004. The aircraft was involved in aircraft-type currency and night training for the pilot. The instructor pilot was a 43-year-old CFII with 835 flight hours. The pilot/student, who was flying at the time of the accident, is a 27-year-old private pilot with 143 flight hours. She had previously been checked out on the Cessna 182 by a local flying club, logging 9-1/2 hours with 25 take-offs and landings. The accident will be investigated by the National Transportation Safety Board (NTSB), the Boston FAA FSDO, and the Civil Air Patrol’s Maryland Wing. Three out of the four Civil Air Patrol landing accidents that have occurred this year had CFI’s aboard. The certified flight instructor (CFI) and certificated private pilot were not injured. Night visual meteorological conditions prevailed, and no flight plan was filed for the local instructional flight conducted under 14 CFR Part 91. According to the CFI, the private pilot was at the controls for the night checkout flight. While landing on runway 18, a 2,400-foot-long lighted asphalt runway, the private pilot flared “a little high,” and the airplane stalled about 20 feet above the runway. The airplane touched down hard on the runway, and came to rest upright. According to this month’s Sentinel, Landings account for more than a third of all General Aviation (GA) accidents. Overall, approximately 25% of landing accidents occur during flight instruction. 4 out of 6 CAP accidents (66%) this year were landing accidents. The numbers don’t add up. These are no student pilots learning to fly. CAP has a very strong Safety Culture. We’ve got to work harder to stop bending airplanes in the training environment. The CFIs that I’ve flown with in CAP have all been top notch airmen. So I just don’t get it. I’m not a CFI… so anyone have any ideas on how we can get better at dual instruction? Luckily, most of the time the worst that happens in these sort of accidents is… a bent prop, ruined engine, and cracked up firewall. Expensive, but usually not deadly. Only about 1-3% of GA accidents caused by poor landings are fatal. During an instructional flight with a certificated flight instructor for a night checkout, the private pilot flared “a little high,” and the airplane stalled about 20 feet above the runway. The airplane touched down hard on the runway, and came to rest upright. The private pilot’s inadequate flare, and the CFI’s delayed remedial action, which resulted in an inadvertent stall/mush and hard landing. A factor related to the accident was the night conditions. Be the first to comment on "CAP Landing Accident in Maryland Wing"